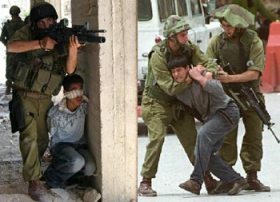 Defense for Children International (DCI), Palestine Branch, has reported that Israeli soldiers have killed 41 children in the West Bank, Jerusalem and the Gaza Strip, since the current uprising began in Palestine, on October 1, 2015. Sixteen of the slain children were killed this year. The IMEMC added the name of the child who was killed, along with her mother, in Gaza. DCI said that, on February 5th of this year, soldiers killed Haitham Sa’da, aged 14, from Halhoul town. in the southern West Bank district of Hebron, while kidnapping his cousin, Wajdi Sa’ada. Also 14, and chased their friend, who was later taken prisoner. Wajdi told DCI that he and Haitham, along with their friends, were walking near a bypass road used mainly by Israeli soldiers and settlers, before some soldiers hiding in the area opened fire on them. Haitham was killed after suffering gunshot wounds in his upper body, while Wajdi was taken prisoner. DCI said Haitham was shot with a live round which entered his back, severing his spine and puncturing his lung, and exited through his mouth, and that the soldiers then cuffed and blindfolded Wajdi and took him to a nearby military outpost in Karmie Tzur colony, where he was forced to stand in the cold for more than 90 minutes. The soldiers held the child until midnight and, then, started interrogating him, without any legal representation or even the presence of a family member. DCI said the interrogator tried to force Wajdi to say that he carried a Molotov cocktail, but he rejected their claims and demands. The interrogator then started shouting and banging his hand on the table, in an attempt to scare the child into making a false confession. The next day, Wajdi was cuffed, chained and blindfolded; the soldiers forced him to walk in front of them while shouting and cursing at him, and then transferred him to the Ofer prison. He is now awaiting trial. DCI also said that the Israeli army implements “shoot to kill” policies, reaching very dangerous levels of extrajudicial murder. Another case DCI has been working on is that of Mahmoud Sha’lan, aged 16, from Deir Dibwan town, north of Ramallah, after soldiers killed him on February 26, near Beit EI settlement. An eyewitness told DCI that he was waiting for the soldiers to allow him, and at least five other drivers in their cars, to pass through the Beit El roadblock. He said Sha’lan then started walking towards the roadblock, carrying nothing in his hands. Medical sources at the Palestine Medical Center told DCI that Sha’lan was shot with five live rounds; three in his chest and two in his arm. DCI reiterated that the occupying force, under International Humanitarian Law, must provide protection to the people it occupies, must protect the children, and is obliged to conduct serious investigations into all crimes committed against those civilians. “But, this rarely happened; since October 1, Israel never investigated any of the fatal shooting incidents against children,” DCI added. Israeli authorities even rejected demands from the victims’ families to perform autopsies. Israel is still holding the corpses of two children identified as Masan Manasra and Mo’taz Oweisat. 1. Abdul-Rahman Obeidallah, 13, from Aida refugee camp in Bethlehem, killed on October 5, 2005. 2. Ishaq Badran, 16, from Kafr Aqab in Jerusalem, killed on October, 10, 2016. 3. Marwan Barbakh, 10, from Khan Younis in southern Gaza, killed on October 10, 2015. 4. Ahmad Sharaka, from the al-Jalazoun refugee camp in Ramallah, killed on October 11, 2015. 5. Mustafa Khatib, 17, from Jabal al-Mokabber in Jerusalem, killed on October 12, 2015. 6. Hasan Mahani (al-Manasra), 15, from Beit Hanina in Jerusalem, killed on October 12, 2015. 7. Tareq Natsha, 16, from Hebron’s Old City, killed on October 17, 2015. 8. Bayan Asaliyya, 16, from Hebron’s Old City, killed on October 17, 2015. 9. Mo’taz ‘Oweisat, 16m from Jabal al-Mokabber in Jerusalem, from Hebron’s Old City, killed on October 17, 2015. 10. Bashar al-Ja’bari, 15, from Hebron, from Hebron’s Old City, killed on October 20, 2015. 11. Ahmad Kamil, 17, from Qabatia in Jenin, killed on October 24, 2015. 12. Dania Ersheid, 17, from Hebron’s Old City, killed on October 25, 2015. 13. Mahmoud Nazzal, from Qabatia in Jenin, killed on October 31, 2015. 14. Ahmad Abu ar-Rob, 16, from Qabatia in Jenin, killed on November 2, 2015. 15. Sadeq Abdul-Aziz Gharbiyya, 16, from Sanour in Jenin, killed on November 10, 2015. 16. Mahmoud Wadi, 17, from Sa’ir in Hebron, killed on November 13, 2015. 17. Ashraf Qatanani, 16, from Askar al-Jadeed refugee camp in Nablus, killed on November 22, 2015. 18. Hadeel Awwad, 14, from Qalandia refugee camp in Jerusalem, killed on November 23, 2015. 19. Ala Hashshash, 16, from Askar al-Jadeed refugee camp in Jerusalem, killed on November 23, 2015. 20. Ibrahim Daoud, 16, from Deir Ghassana in Ramallah, killed on November 25, 2015. 21. Ayman al-‘Abbassi, 17, from Ras Jerusalem, killed on November 29, 2015. 22. Ma’moun al-Khatib, 16, from Doha in Hebron, killed on December 1, 2015. 23. Mustafa Fannoun, from Hebron, killed on December 4, 2015. 24. Abdullah Nasasra, 15, from Beit Forik in Nablus, killed on December 10, 2015. 25. Noureddin Sabaghna, 17, from Qabatia in Jenin, killed on December 27, 2015. 26. Ahmad Kawazba, 17, from Sa’ir in Hebron, killed on January 5, 2016. 27. Ala Kawazba, 17, from Sa’ir in Hebron, killed on January 7, 2016. 28. Khalil Wadi, 15, from Sa’ir in Hebron, killed on January 7, 2016. 29. Adnan al-Mashni, 17, from Hebron, killed on January 12, 2016. 30. Roqayya Abu Eid, 13, from Anata in Jerusalem, killed on January 23, 2016. 31. Hussein Abu Ghosh, 17, from Qalandia in Jerusalem, killed on January 25, 2016. 32. Ahmad Toba, 17, from Kafr Jammal in Tulkarem, killed on February 1, 2016. 33. Ahmad Sa’ada, 14, from Halhoul in Hebron, killed on February 5, 2016. 34. Omar Madhi, 15, from al-‘Arroub refugee camp in Hebron, killed on February 10, 2016. 35. Na’im Safi, 16, from al-‘Obeydiyya in Bethlehem, killed on February 14, 2016. 36. Fuad Waked, 15, from al-‘Arqa in Jenin, killed on February 14, 2016. 37. Nihad Waked, 15, from al-‘Arqa in Jenin, killed on February 14, 2016. 38. Qussai Abu al-Rob, 16, from Qabatia in Jenin, killed on February 21, 2016. 39. Mahmoud Sha’lan, 16, from Deir Dibwan in Ramallah, killed on February 26, 2016. 40. Labeeb Azem, 17, from Qaryout in Nablus, killed on March 2, 2016. 41. Mohammad Zaghlawan, 17, from Qaryout in Nablus, killed on March 2, 2016. It is worth mentioning that the Israeli army also killed Rahaf Yahya Hassan, 2, and her mother, Nour Rasmie Hassan, 30, who was five months pregnant, after bombarding their home in the Zeitoun neighborhood, in Gaza city, on October 11, 2015.